Born in New Zealand to a Scottish father and an English mother, Stef and her family moved to Toronto, Canada when she was four. Stef lost her right foot in a boating accident, aged 16. Her life was saved by a surgeon in Toronto who managed to stem the blood flow through amputation. Having loved sports before the accident, she played rugby union but encountered difficulties post her amputation with referees who felt the artificial leg could injure other players. Moving on to focus upon her studies, Steff gained a full scholarship to Queen's University to study biochemistry. 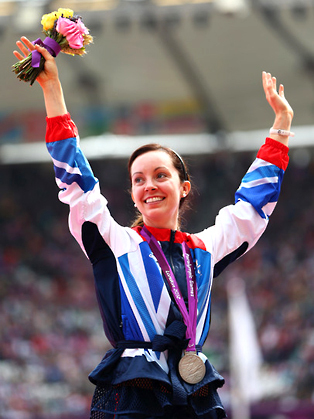 After joining the campus track and field team, three years later she competed at the BT Paralympic World Cup in 2008. With the option to compete for three countries (based on her of place of birth, the nationality of her parents and her place of residence) she formerly represented Canada in the Beijing Paralympic Games, finishing third in the 200m and fifth in the long jump. Stef took the decision to compete for Great Britain soon after the Paralympics in 2008. It wasn’t an easy choice but one that has been vindicated with some impressive results. Steff spent a year out of competition in 2009 in order to complete her switch and has fully embraced British life, training at Loughborough University. Her husband, Brent Lakatos, is an elite wheelchair racer and won 3 silver medals for Canada at the 2012 Paralympics. He has also relocated to England from Dallas, Texas, where the dynamic duo will continue to train side by side for Rio 2016. Stef’s truly multi-cultural upbringing has helped shape her fantastic personality. Away from the track Stef is an academic scholar and has a degree in Biochemistry. She is currently completing a Masters in Nutrition, an area she hopes to work in once she’s finished competing. Stef was also the face of Channel 4’s new Paralympic coverage and gained notoriety for completing a stunt jump over a car in the opening credits. She is also an accomplished motivational speaker and has undertaken several visits to local schools as part of her Ambassador and educational remit.